Buy your Designer Brand dresses here! We deliver directly from Brisbane Australia. fashion items from only the best designer brands. our customers access to the latest trends and seasonal fashion. update your wardrobe and be ready for any occasion for less! wide range of cocktail, casual or wear to work dresses! Dresses Choose from 218 garments. We'll tell you our little secret. If you want to look amazing you need to wear a designer dress from our most amazing selection of formal and prom dresses that have just arrived from the US. Look stunning wearing a top label designer made formal dress. 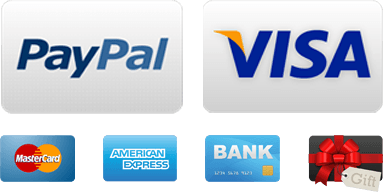 Order your formal dresses online directly from Brisbane Australia. Whether you are looking for something chic and sophisticated or bright and bold, we have the perfect outfit for you. Have an unforgettable evening in one of our formal dresses! Are you looking for designer cocktail dresses in Australia? Our online store has everything you need. Whether you are looking for something chic and sophisticated or bright and bold, we have the perfect outfit for you. We pride ourselves on our exclusive collection, which is regularly updated to include all of the latest trends. We select from all of the popular designers and brands to give you the best choice for an upcoming event. We believe that looking fashionable doesn’t need to be expensive. That is why we offer our items at a fraction of the retail cost. To add to our great prices, we also offer free shipping, condition may apply. Combine this with our secure checkout, 30 day free return policy and reliable delivery and you’ll see why we are quickly becoming your first choice for quality women's designer clothing. Our selection of premium and affordable designer cocktail dresses is ideal for a range of occasions and can be worn with accessories to complete your perfect look. We have selected items from all the best brands such as DKNY, Ralph Lauren, Tommy Hilfiger and more to ensure you look radiant during your next event. View our selection of cocktail dresses and buy the perfect dress for an unforgettable evening! Want to look amazing at the office? Select from our premium brands and quality designer dresses. BUY WITH CONFIDENCE! We measure all our products to ensure correct sizing. Ralph Lauren Black Sweaterdress with silver stripes and boat neck. 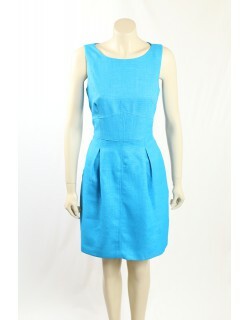 The dress is made in in a Soft Stretch Cotton Blend. 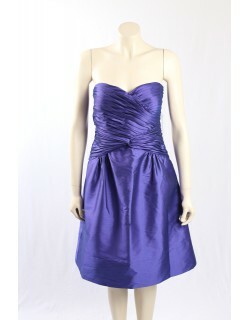 Stunning Strapless Cocktail Dress in Purple with a Shimmer throughout and fully Lined. The material is made from a stiff polyester and holds its flattering style. 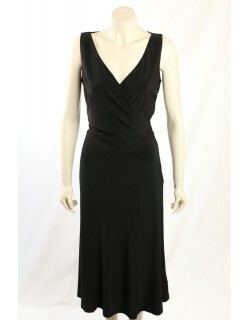 The top of the dress is elegantly pleated ending with a knot twist at the botton. While the overall colour of the dress is purple, the material is a woven in thin stripes of purple and blue. Stunning Lace Cocktail Dress. The dress is made from a beautiful lace and is fully lined. Extremely elegant cocktail dress from Adrianna Papell with 3/4 sleeves and an inset mesh at the top. The dress is knee long and has a hidden zipper at the back. Aqua Sequined cocktail dress Black and White and in stretch. 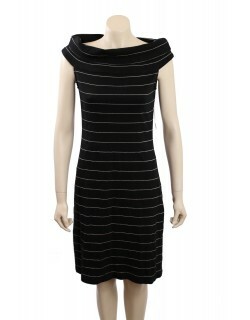 The dress is sleeveless and goes above the knee.